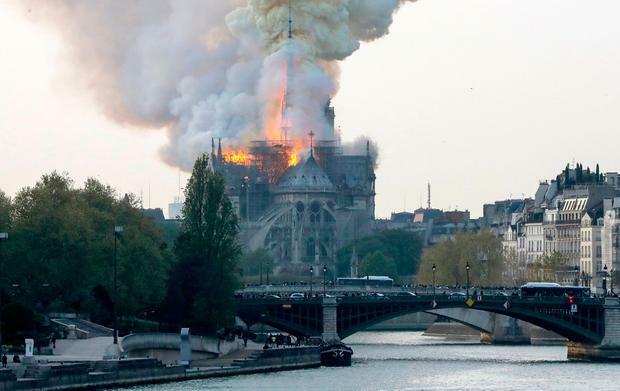 Bystanders from around the world cried out as the 13th-century Gothic masterpiece's beloved spire - one of the highest points of the capital - came crashing to the ground in flames. Tears were shed as burning ash fell over the Ile de la Cité, the original island that housed the earliest Parisian settlement. 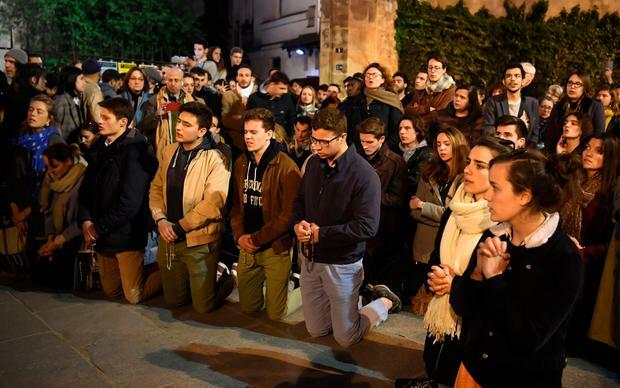 Crowds of stunned Parisians could do little but offer prayers from the banks of the Seine, singing 'Je vous salue, Marie', the French equivalent of 'Hail Mary', as the flames raged higher. Victor Hugo helped save the cathedral almost two centuries ago by immortalising the edifice in his novel 'The Hunchback of Notre-Dame'. Last night, the French deputy interior minister said saving it was "not certain". Some 400 firemen appeared powerless to prevent the blaze spreading after it broke out at 6.50pm local time. Despite reaching the scene within 10 minutes, their hoses could not reach the highest parts of the cathedral from 30m-high ladders that were dwarfed by a tower three times that size. 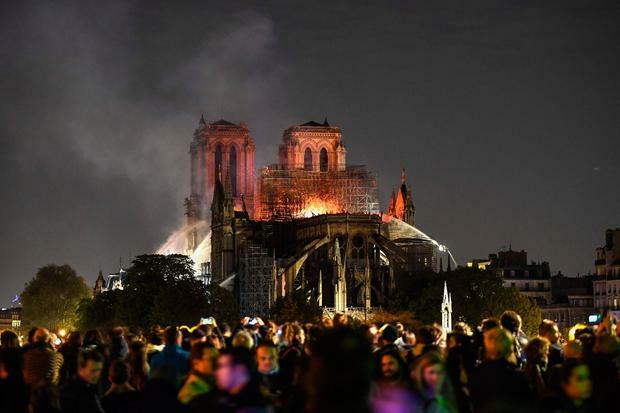 Last night, Jean-Claude Gallet, the fire chief, said they were not sure they would be able to stop the fire from spreading, after it engulfed the roof and spire, and one of its towers. One Parisian bystander, Fred, said: "People are just in a state of total shock. It's almost like a cultural September 11." Nobody was hurt in the blaze. In a tragic twist, it appears the blaze began on scaffolding near the top of the building as major renovation works, intended to save the building from collapse, got under way. Last week, footage showed workers removing 16 copper statues from the spire. Christine Moreau, a Parisian, choked back tears as she said: "It's tragic. Notre-Dame is part of the heart of Paris and part of our hearts too. Why couldn't more have been done to put out the blaze?" "This is really sad - the saddest thing I've ever stood and watched in my life," said Sam Ogden, a British tourist. "It looked tiny to begin with, then within an hour it all came down." 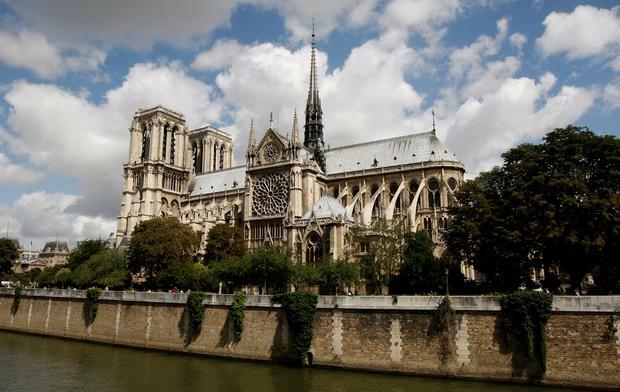 Anne Hidalgo, the Paris mayor, said: "No words can described the pain I feel in seeing Notre-Dame ravaged by flames. Tonight, all Parisians and French mourn this emblem of our common history." She said that Paris, however, would find the force to rebuild the edifice from its motto: "Fluctuat nec mergitur" (Tossed by the waves but does not sink). "Everything is burning, nothing will remain from the frame," Notre-Dame spokesman Andre Finot said. The majority of the cathedral's artefacts, including the Crown of Thorns - a relic believed by some to be the crown worn by Christ at the Crucifixion - and the Holy sacraments, were reportedly saved from inside the main building. But as the flames failed to abate, it appeared that the cathedral's famous stained glass windows had melted. Emmanuel Macron, the French president, cancelled a television address to the nation last night and instead , he rushed to the scene with Edouard Philippe, the prime minister, and Christophe Castaner, the interior minister, to see the "terrible fire ravaging Notre-Dame".